ZIGGURAT is the annual bike ride for the construction and built environment sector. It takes place on 12-16 September. Brian is helping to raise money for Action Medical Research; a charity that supports hundreds of thousands of children and babies who are devastated by disease and disability. 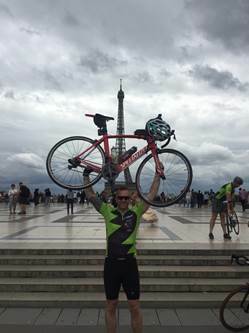 Last year Brian raised over £5,000 by completing the Ziggurat 2017, 280 mile cycle ride from London to Paris. During his four-day journey, he cycled through torrential rain storms, survived a crash, and became the highest single fund-raiser in the 48-strong group. Brian has held senior health and safety roles within the working at height sector, including 15 years as a senior IPAF training instructor. He is an IPAF UK Council member and new Chairman of the PASMA Training Committee. He is a current member of IPAF Training Committee, as well as being an active member of the Strategic Forum Plant Safety Group MEWPs Committee. Brian was also recently appointed onto the HAE Tools, Plant & Equipment Board.